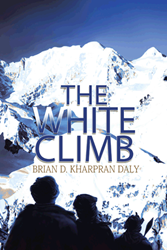 Author of many extraordinary books, Brian D. Kharpran Daly once again offers a novel that highlights the thrill of mountain climbing and caving, “The White Climb” (published by Partridge India). The story gets more intriguing as the adventure suddenly gets caught in the political intrigues of terrorists. The book follows Raymond Sunn, a mountaineer invited to join a mountaineering expedition to the far reaches of Leh, Ladakh. After summiting the snow-bound peak, he with a few of his climbing comrades, investigated a cave he had noticed on his ascent of the mountain. Little did he know that his inquisitiveness would get him and the expedition team members into serious trouble when the cave, halfway up the mountain, proved to be a cache of a huge amount of explosives and other armaments of Pakistani terrorists who had sneaked into India on a mission to create chaos in New Delhi and to assassinate the Prime Minister of India on the country’s celebration of its 65th anniversary of independence. Laced with the adventures of climbing and caving along with the intrigues of terrorism, the book hopes to put forward an interesting amalgamation of both worlds. Brian D. Kharpran Daly was born in Shillong, Meghalaya. He was awarded the prestigious Tenzing Norgay Bational Adventure Award 2002 by the government of India for his pioneering work in the discoveries and documentation of the caves of Meghalaya. Partridge India, a Penguin company, is a leading provider of book publishing, marketing, and bookselling services for authors in India, all priced appropriately for the Indian market. Committed to providing the highest level of customer service, Partridge India assigns each author personal publishing and marketing consultants who provide guidance throughout the process. Partridge India shares its headquarters with Penguin Books India in New Delhi. For more information or to publish a book, visit http://www.partridgepublishing.com/india or call 000.800.10062.62. For the latest, follow @PartridgeIndia on Twitter.